Roll out the gingerbread dough to approximately 3mm thickness. Cut out a lid measuring 5.5cm (2.25"). Bake according to instructions and leave to cool. Make up the icing according to the instructions but make it nice and thick (a bit thicker than toothpaste) and transfer to a piping bag fitted with a round tip. Line a small plate with baking paper and place the base biscuit on top. Pipe icing around the outside of the square and then sit a glass or jar inside. Attach one of the sides and then add the opposite side. Pipe icing up the edges of each one and then add the remaining two sides. Fill in any gaps with extra icing. If the sides are falling away, use more glasses to hold them in place while they dry. Repeat with the remaining biscuits and icing. Prepare the fondant icing and roll it out to about 2mm (0.1)". Use a pastry or pizza cutter to cut into strips approximately 16cm (6.25") long and 1cm (0.5") wide. You will need 2 for each box. Cut more strips 1.5cm (0.5") wide. You will need one 12cm (4.75") for each box to make the bow and another 10cm (4") long for the tail of the bow. Cut the 10cm strip in half and cut the end into a triangle as shown. To make the bow, fold one half of the strip in to the middle and fold the other over to overlap. turn it over and press the middle and plump up the sides to make the bow. 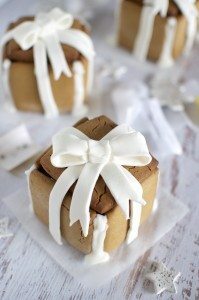 Cut another small strip of icing and wrap it around the middle then pinch it together. Fill the box with goodies then place the lid on top. Pipe a little bit of icing where the ribbon will sit down the sides of the box and drape the icing over the top. Pipe a little more icing into the middle and attach the end of the bows. Pipe icing on top of the pieces you just added in the middle of the box and add the bow.